Food experts say bacon is more popular then ever — so much so that some predict a shortage in the next few years. Here's what to eat until then. NEW YORK (MainStreet) — For the second year in a row, Hormel Foods will be taking its Black Label Bacon Bike on the road to bacon festivals around the country, which normally might not be noteworthy. The customized motorcycle is also the focus of a beautifully shot, folksy documentary, Driven by Bacon, starring actor Eric Pierson. The short film chronicles a cross-country road trip made on the bike to introduce it to Americans, but it also showcases our love of bacon. Is bacon biodiesel the wave of the future that will save us from drilling for oil? Hormel says no. That wasn't the intention of the bike or film. Their goal was to inspire people to think differently. "When we set out to create this bacon-powered motorcycle, it wasn't about developing a viable, sustainable fuel source. We are by no means saying that pork-based fuel is the wave of future," says Scott Schraufnagel of BBDO, the advertising agency that developed the campaign for Hormel. "This spotlights creativity and ingenuity, the opportunities and possibilities that can exist in this space. It's a bit of showpiece to build excitement around that." Making biofuel from bacon in massive quantities would be expensive and inefficient. Biofuels made from larger-scale inputs such as ethanol made from corn sugar are far more cost effective, says Hormel's Nick Schweitzer, brand manager of breakfast meats. "What this does show, though, is that sustainability should be in everybody's mindset," Schweitzer says. "But it's not like you're cooking up a pound of bacon and pouring it into the motorcycle. There's a big middle step." Still, the company does seem to have achieved its goal of starting a nationwide conversation about alternative fuels. Since the bike's introduction people have come out of the woodwork to share stories with Hormel about alternatives they've developed — everything from making fuel from french fry oil to algae — making the future appear ripe with possibility. "It's like breaking bread, it's a great conversation starter," Schraufnagel says. While not necessarily making fuel with it, chefs and culinary directors across the country say bacon is more popular then ever — so much so that some are predicting a shortage in the next few years. Typically inexpensive, It's being used in ever more creative ways, included in everything from bacon ice cream and milkshakes to bacon jelly and bacon popcorn. "Bacon is super hot. There's bacon in everything and it has been that way for four or five years now," says Tavistock Restaurant Collection Culinary Director Patrick Quakenbush. "Most cities around the country have a bacon fest. Bacon fests are huge. And bacon is being used to make everything — bacon ice cream, people are crumbling up bacon bits and putting them on top of donuts — the list goes on and on. It all really comes from the popularity of the celebrity chef. People are now becoming foodies, and bacon adds three or four different elements to a dish — salty, smoky and sweet." With this in mind, here's a look at some of the best places to eat bacon across the country and the unique dishes being created with it. Castile at The Hotel Zamora, Tampa, Fla.
At the award-winning Castile restaurant, the chef serves up a mean housemade crispy chicharron bacon. 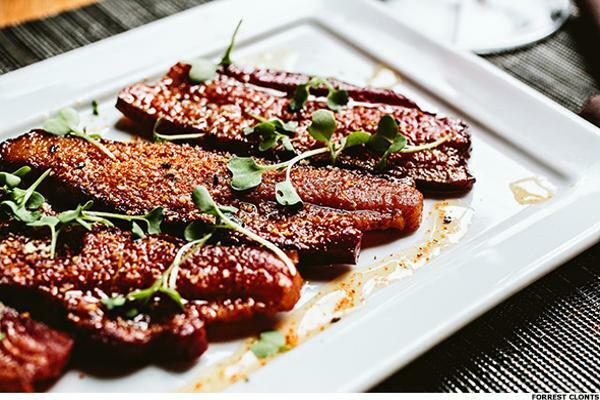 Made with locally sourced pork belly that's cured and smoked in-house, the bacon is sliced to order in one- to two-inch pieces, fried until brown and tossed in a tamarind gastrique that contains caramelized sugar and vinegar. The chicharron is served with eggs on the breakfast menu and as a stand-alone item for lunch. Bacon Bros. Public House, Greenville, S.C.
One fan calls Bacon Bros. the "real deal" when it comes to all things meat, but especially bacon. Bacon Bros. is home to a state-of-the-art cure room, the only one of its kind in South Carolina, and there's also a smokehouse behind the restaurant where bacon is smoked for three days on local Peach Wood. 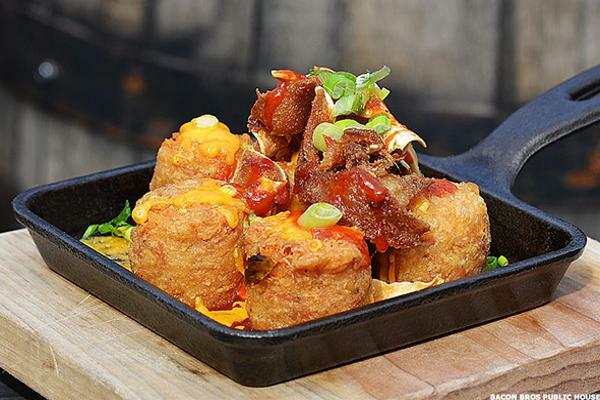 The restaurant's menu includes such things as the Italian bacon Pancetta, Bacon Caramel Popcorn (made with salted caramel and three-day smoked bacon) and Potater Tots that come with pit-cooked pork shoulder, American cheese and pig ears. There are those who say bacon is a way of life in Iowa, and Jethro's is a bacon lover's dream. Featured on everything from the Travel Channel's Man v. Food to the Discovery Channel's United States of Bacon, this restaurant serves such things as a pail of hickory smoked bacon as an appetizer, sweet bourbon-glazed short ribs wrapped in bacon and bacon ice cream. This restaurant is most known for its bacon jam (and for putting bacon on nearly everything). The jam, made from bacon pieces rendered and mixed with sugar and spices, is applied to such things as Dixie-fried chicken biscuits, asparagus, burgers and desserts. Whole bacon is used as a topping for a mouthwatering dish of Deviled Eggs with Fried Oysters. 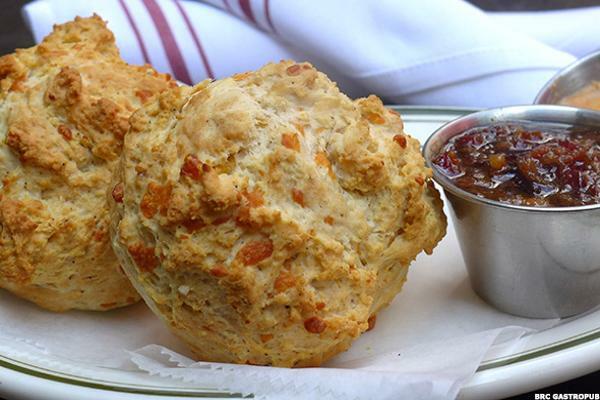 The restaurant's top seller is its Cheddar Bacon Biscuits and that Bacon Jam. "When it comes to bacon, anything goes," says Lance Fegen, the restaurant's culinary director and partner. "It goes on biscuits, on vegetables, on grilled oysters, on deserts. It goes wherever the customer wants it to go. And that's pretty much the limitation." The bacon here even goes in 20-ounce milkshakes costing $8 each. "They're made with our soft serve ice cream from Illinois that's 12% milk fat — as much fat as you can get, plus bacon," Fegen says. "It's not good for you at all, but it works, it really does. People will come in and say 'Just put some bacon in there and put it in the blender.'" 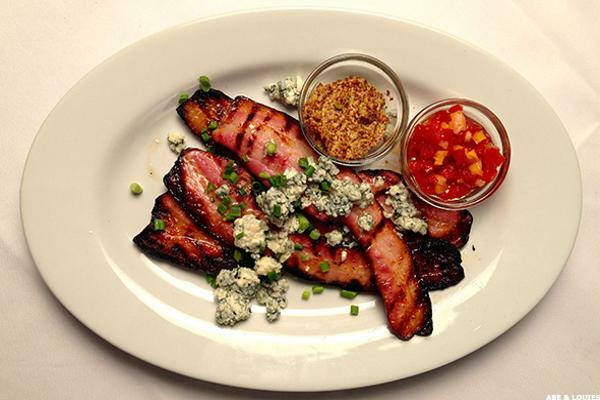 Abe & Louie's is such a popular bacon destination that the meat has earned its own spot on the appetizer menu. The restaurant's bacon dish is wood-fired, topped with fresh blue cheese and served with whole grain mustard and peppadew relish. A key factor in the appetizer's savory flavor is its source, says Tavistock Restaurant Collection Culinary Director Patrick Quakenbush. Abe & Louie's is not serving just any old bacon, but product from Nueske's — a family-run business dating back to 1887 that makes a nearly revered bacon. The family came from Europe to Wisconsin, bringing along dozens of recipes for spicing and curing meat. "Not only do they have century-old recipes, they import all of their seasonings from Italy and smoke everything over Applewood," Quakenbush says. "When you have bacon like that, it eats great by itself. So we cut it really thick and simply grill it ... you have this smoky, sweet bacon with creamy blue cheese." 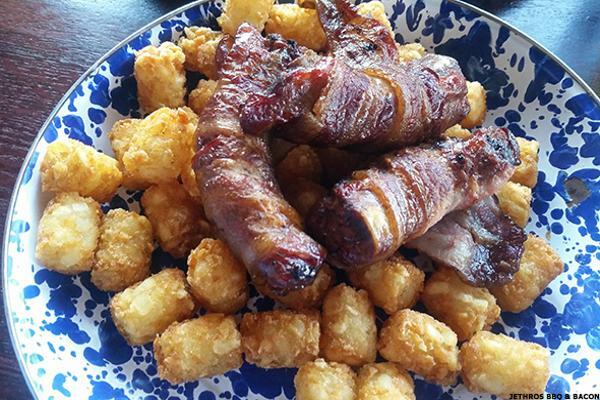 The restaurant has sold 1,700 pounds of its famous bacon appetizer just since Jan. 1. The Oak Table, Columbia, S.C. Somewhat new to Columbia's restaurant scene, The Oak Table has already found a way to distinguish itself. In addition to specializing in a locally sourced menu, the restaurant offers a Nueske's bacon appetizer of thick-cut strips kissed with a maple-honey glaze, citrus panko and togarashi. The flavor is unlike anything else in South Carolina. BaconMania, Orange County and Sacramento, Calif.
BaconMania is a bacon lover's paradise on wheels, delivering bacon prepared in a multitude of ways to a location near you (as long as you're a resident of Orange County or Sacramento, where the trucks circulate). Every dish served by the truck involves bacon in some way. The over-the-top, guilt-inducing offerings include Bacon Cheese Crisps made of sharp cheddar cheese and hickory-smoked bacon crumbles, fried to a crispy chip; Bacon Balls; and Chichee Fries — a mixture of crispy french fries topped with the truck's smoky Chili con Bacon and, just for good measure, some additional crumbled bacon. "We call it food like you wish your mom used to make," owner Karen DiEugenio says. The truck's Jack Back Sammie is its trademark offering — a twice-grilled cheese sandwich with bacon that has been featured on the Food Network, Discovery Channel, Cooking Channel and Travel Channel. 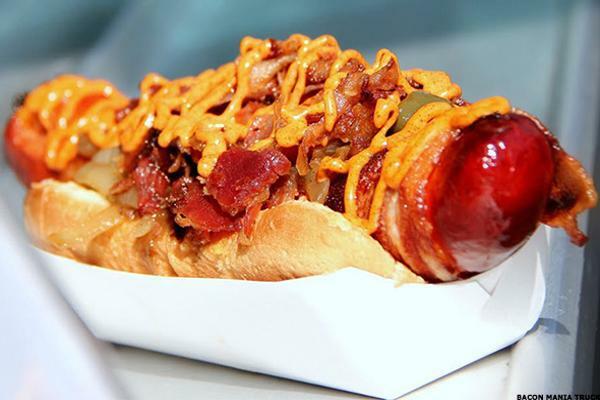 Other crowd favorites include the truck's bacon-wrapped Rico Dog and its Mac'n Bac'n, named "America's Best" by Travel + Leisure magazine. "Even our brownie bites are wrapped in bacon," DiEugenio says. "We do bacon-wrapped peanut and butter jelly sandwiches and deep fry them. They sell out every single time we have them. They're always the first thing to sell out, and then people beg for more ... You can do anything with bacon. We've had bacon shakes. A lot of times it's the customers challenging you to take it to the next level." "The thing I enjoy most about working on a bacon truck is that when people order they have this look on their face like they are doing something naughty," DiEugenio says. "So it's fun."